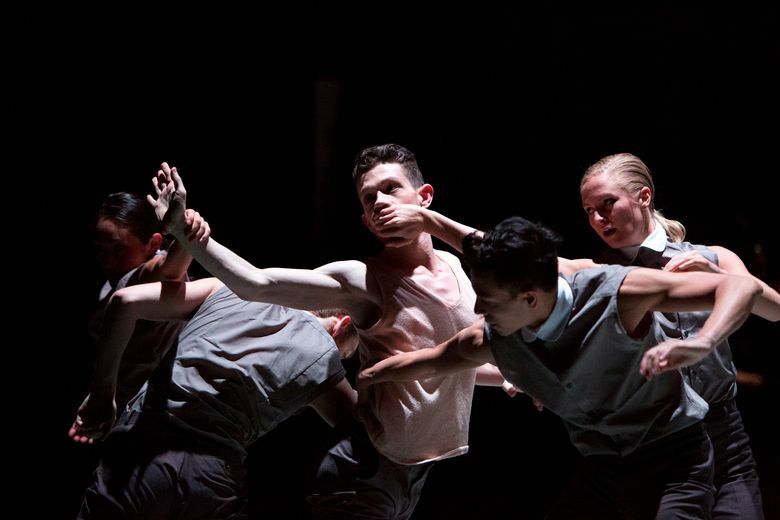 A review of dance company Whim W’Him’s “IN-spired” at Cornish Playhouse at Seattle Center, a program featuring the spooky and sinister “Ghost Behind Me” by choreographer Dominic Walsh. In the shadows, a small chamber ensemble seated on a strangely crowded bandstand starts to play cabaret-flavored tunes. Behind them, a figure in a black hood makes silky-snappy hand signals, accentuating the off-kilter beats in the music. After a moment, the dense silhouette of players on the bandstand seems to melt, and half a dozen dancers, no longer tucked in among the feet of the musicians, take the stage. Repeats 8 p.m. Jan. 29 and 30, Cornish Playhouse at Seattle Center, 201 Mercer St., Seattle; $15-$30 (1-800-838-3006 or whimwhim.org). 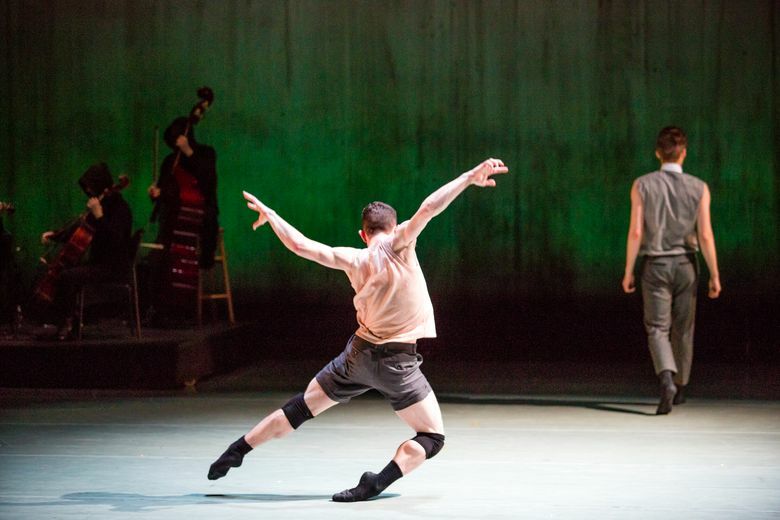 It’s the highlight of Whim W’Him’s “IN-spired,” and another example of company founder-director Olivier Wevers introducing a dandy new choreographic talent to the Seattle scene. It’s also tailor-made for Whim W’Him’s newest member, Bainbridge Island native Patrick Kilbane, whose extraordinary flex-and-ripple technique is a thing of wonder. “Ghost” creates an atmosphere of sinister manipulation as a marionette-like Kilbane is alternately squeezed, folded and whisked into midair by the seductive-abusive attentions of his fellow dancers. That black-hooded puppet master (Justin Reiter) has a particular agenda in mind. Kyle Matthew Johnson and Tory Peil, in their different ways, are equally set on messing with him. Walsh, a former principal dancer for Houston Ballet and recent winner of the dance world’s prestigious Princess Grace Award, has a theatrical-musical flair that makes every passage of “Ghost” captivating. In his hands, Kilbane is a rubber-limbed revelation as he tries to devise movements and manipulations of his own. The live score by Houston’s Two Star Symphony lends an eerie-jaunty vibe to the proceedings, and Michael Mazzola’s intricate, puzzle-like lighting completes the spooky picture. The other two works of “IN-spired” aren’t on the same plane. Wevers’ “Brahms and Tights” is a slinky, spiraling perpetual-motion machine for seven dancers, powered by a shrill recording of an excerpt from Brahms’ Violin Concerto in D Major. It aspires to nonstop fluidity at top speed, but doesn’t look as effortless as intended — maybe an impossible task even for these dedicated dancers. Mark Haim’s “Overflow,” set to music by Wagner, gives individual performers more opportunities to shine in an array of maverick moments. The piece, dedicated “to my mother, an immigrant, and my father, a refugee,” suggests moments of rescue and chance connection. But it falls short of riveting. “Ghost” is the indisputable draw on this program.